When I received this item, it seemed to be a little sticky around the fulcrum where the float would need to move. Yesterday it proved to be faulty as my wife came home to tell me my “fish water was leaking all over the garage.” No harm done since I store my water in the garage, but a lot of water wasted and got my car wet. This item does not work for me. I learned this the hard way and sure hope you won't make the same mistake as I did. I left the RO/DI unit running and got distracted for too long. By the time I remembered, the entire vinyl floor was flooded and soon all VCT tiles started peeling off at the edges. It was then I looked into this valve and it works really well. Installation is very easy. Say goodbye to flooding the floor!! Despite being stainless steel, the metal parts on these do eventually rust and will contaminate your water with potentially dangerous heavy metals. BRS should stock a different brand that contains no metal parts. This is my first time using a float valve. It works as advertised and it is easy to install with no leaks! This product works perfectly and is very easy to install. I purchased a 1/2" glass drill bit and put this into a 29g tank that I use as a new ATO reservoir for my two systems. I use this along with a solenoid valve and 2 optical sensors and couldn't be happier. No more flooding the inside of the tank stand. Since our water pressure is somewhat higher than normal, (approx. 50-60 psi), I am assuming that is why the float I purchased never would completely stop the water flow. Great product. Easy to set up and works as designed. I used mine in a brute garbage to hold RO water. 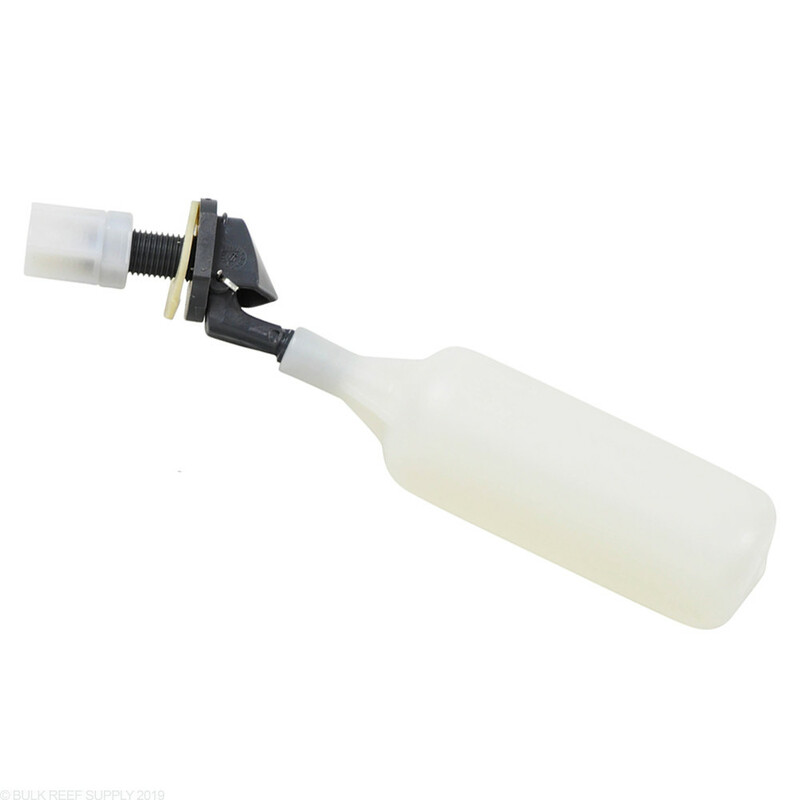 This has saved my rear end a few times when I was filling my brute container with RODI water. Do not buy the adjustable float switch. They fail. Buy this one and don't worry. I bought this product to install on my Brute RO holding container. One accidental overflow of my RO container convinced me I needed some type of fail safe. 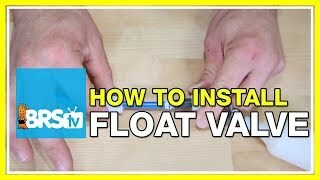 I installed this float valve in minutes and it has worked perfectly. No more accidental overflows! My wife and mother-in-law are much happier now and this little float valve relieved the anxiety. I have used these for many years. They do the job nicely. I have never had one fail on me. Knock on Wood. There is another model that has the ability to change the position of the float angle allowing for some modifications to the use. Really easy to install. Works great. This float saved me from having a flooded garage. No more waiting for the timer to go off or even forget about it totally.thos float works great. I would never do it again without this in my ro/di storage containers. 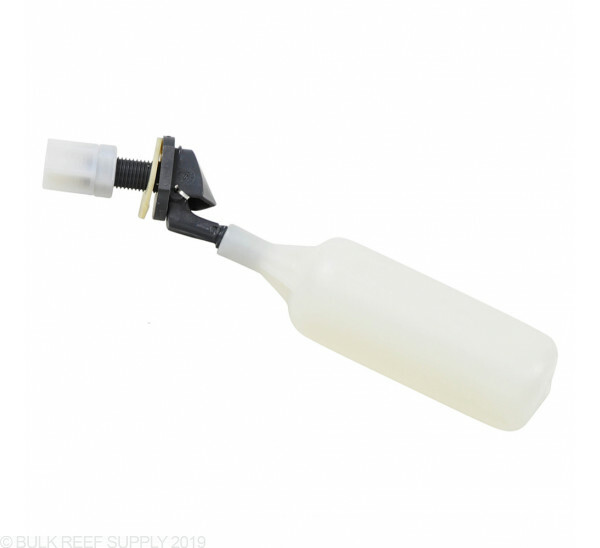 Hello, I purchased the 6 Stage 75 GPD Plus RO/DI System from Bulk Reef Supply, and I'm considering purchasing the PSI Booster Kit as well. 2 questions I have are 1. Is this all I need to purchase to stop the flow, or do I need the whole float kit? 2. Is this compatible with the PSI Booster? Thanks! Thanks for asking, and all you would need to increase your pressure is the Booster Pump Kit. Your RODI system already has an Auto Shut Off Valve installed along with a check valve. 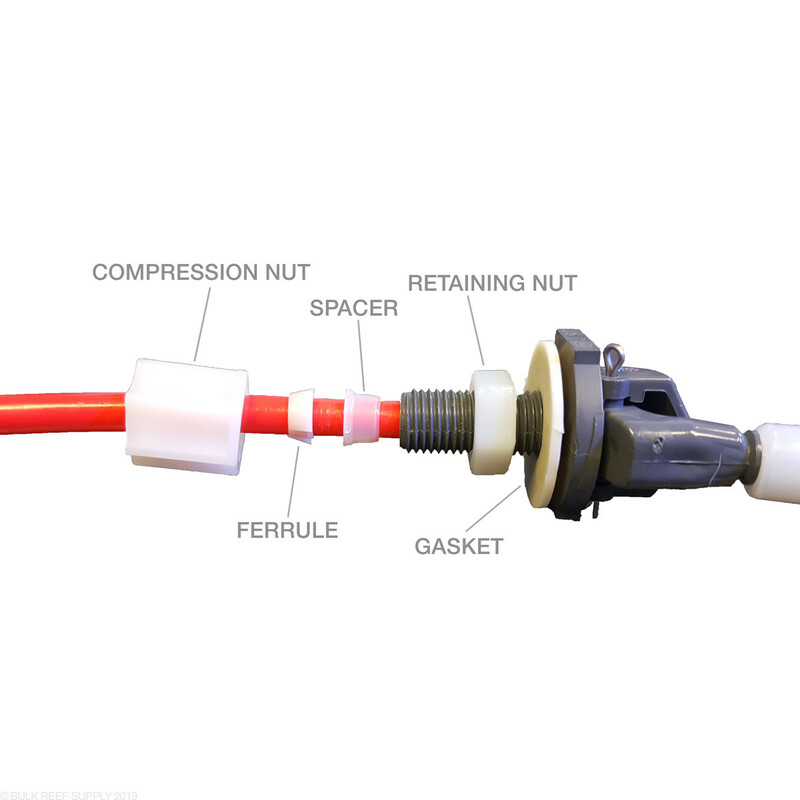 After the booster pump and pressure switch are connected and energized the booster pump will turn on when there is no back pressure in the product water line. By using a float valve or ball valve on your product water line to shut off the flow will slowly create back pressure in the line and once it reaches about 40 PSI the pressure switch that comes with the booster pump will activate and the entire system will shut down, even the waste water. Does this create a water tight seal? If I ever want to fill the container higher than the level of the float valve later on, is it likely to leak around the valve hole? 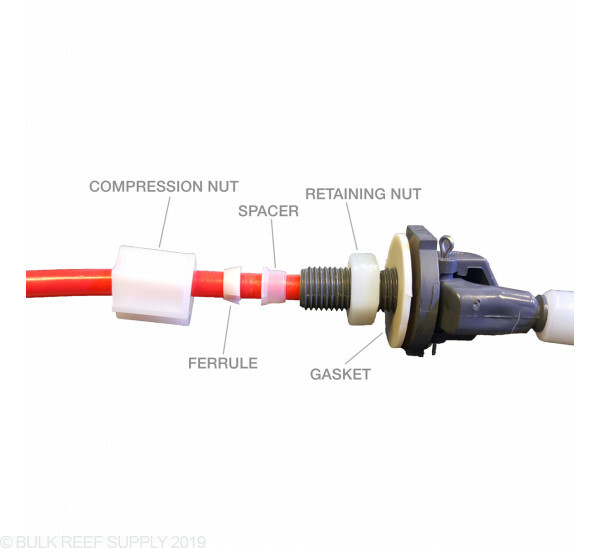 These float valves will provide a water-tight seal once the container is filled to the set level of the float. Do you carry the diamond coated drill bit for this float valve? And, if so, then what size would it be? Thanks! We do not carry a drill bit for the float valves. You will need to pick up a ½” drill bit, which you can usually find at your local hardware store for pretty cheap. Thanks for the question and if you have any more, just let us know. Yes, they can be used with saltwater. The pins may slowly show a little surface rust over time, but no harm will come from it. Depending on the area that you mount the float valve in, you should get a couple years out of the float before rust is a concern. I want to install this valve so that the water level in my storage container is at a specific height. Where will the final water level be in relation to the 1/2" hole needed to install this float valve?